Can entomopathogenic fungus Beauveria bassiana be used for pest management when fungicides are used for disease management? Beneficial fungi such as Beauveria bassiana are pathogenic to insect and mite pests and are commercially available for use in organic and conventional farming. Field studies conducted on commercial strawberry farms with B. bassiana and another entomopathogenic fungus, Metarhizium brunneum show the importance of these microbial pesticides in pest management on conventional farms (Dara 2013, 2014, and unpublished). These studies can make a significant contribution to IPM practices by reducing chemical pesticide use without compromising the pest management efficiency. 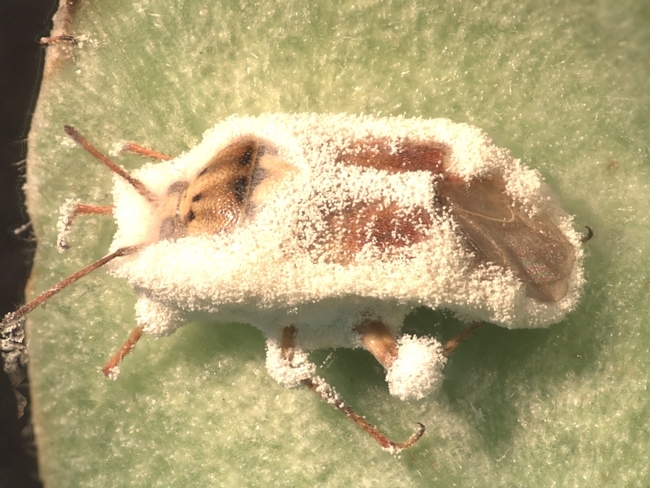 In a cropping system where fungicides are frequently applied for managing various foliar diseases such as powdery mildew (caused by Podosphaera aphanis) and botrytis fruit rot (caused by Botrytis cinerea), the fate of a beneficial entomopathogenic fungus is always an important question. Evaluating the compatibility of various fungicides commonly used in strawberries with B. bassiana is necessary to understand the fungicide and beneficial fungus interactions. A series of studies were conducted to address this issue and to explore opportunities to evaluate their compatibility. In 2012, six bioassays were conducted using fungicides Captan, Elevate, Microthiol Disperss, Pristine Quintec, Rally, and Switch and an organic formulation of B. bassiana (Mycotrol-O) (Dara and Dara, 2013). Mortality and/or infection caused in mealworm (Tenebrio molitor) larvae exposed to surfaces treated with B. bassiana and fungicide was used as a measure of compatibility between the fungicides and the beneficial fungus. Except for Elevate and Quintec, all other fungicides showed moderate to high level of inhibitory effect on the fungus. A follow up study with Pristine showed that increasing the application interval to 1 or 4 days improved the compatibility and resulted in 100% mortality of the mealworms from B. bassiana treatment. Another study was conducted where B. bassiana (BotaniGard ES) was applied 0 to 6 days after fungicides Pristine, Merivon, and Switch were applied (Dara et al. 2014). Switch seemed to have a higher negative impact on B. bassiana than Pristine and Merivon, in general, but the increase or decrease in mealworm mortality with increasing time interval between the fungicides and fungus was variable. Although these two studies indicated that increasing time interval could influence the compatibility of fungicides and B. bassiana,they were conducted only once and warranted additional replicated studies. A new study was conducted from June to August, 2014 where eight fungicides that had different modes of action were applied at 0 to 6 day intervals to evaluate their impact on mealworm mortality caused by B. bassiana. BotaniGard ES applied 0,1, 2…6 days after treating with Captan. BotaniGard ES applied 0,1, 2…6 days after treating with Pristine. BotaniGard ES applied 0,1, 2…6 days after treating with Merivon. BotaniGard ES applied 0,1, 2…6 days after treating with Microthiol Disperss. BotaniGard ES applied 0,1, 2…6 days after treating with Rally. BotaniGard ES applied 0,1, 2…6 days after treating with Rovral. BotaniGard applied 0,1, 2…6 days after treating with Switch. BotaniGard ES applied 0,1, 2…6 days after treating with Thiram. Captan alone applied 0, 1, 2…6 days prior to the exposure. Pristine alone applied 0, 1, 2…6 days prior to the exposure. Merivon alone applied 0, 1, 2…6 days prior to the exposure. Microthiol Disperss alone applied 0, 1, 2…6 days prior to the exposure. Rally alone applied 0, 1, 2…6 days prior to the exposure. Rovral alone applied 0, 1, 2…6 days prior to the exposure. Switch alone applied 0, 1, 2…6 days prior to the exposure. Thiram alone applied 0, 1, 2…6 days prior to the exposure. Including the untreated control, there were a total of 114 treatments in each assay. Each treatment had 10 mealworms that were individually incubated in Plexiglas vials with a piece of carrot after a 24 hour exposure to a paper towel treated with B. bassiana, fungicide, or B. bassiana+fungicide applied at different time intervals. Mortality of the worms was observed daily for 6 days. Treatments of fungicides without B. bassiana were also included to see if they have any influence on the mortality of the worms. These assays were repeated three times using medium-sized mealworms purchased from a commercial supplier. None of the worms in untreated control died during the study. Except for six dead worms out 560 in fungicide only treatments in the first assay, there did not seem to be any impact of fungicides alone on the mortality of mealworms. Among the fungicides tested, Captan (Mode of action group M4) and Thiram (Mode of action group M3) are the only ones that showed a significant negative impact on B. bassiana resulting in reduced mealworm mortality (Fig. 1, Table 1). Other fungicides had no or negligible impact on B. bassiana. When the average total mortality of the mealworms among different time intervals between B. bassiana and fungicides was considered, Captan caused about 57% reduction and Thiram caused 43% reduction in the efficacy of B. bassiana. Remaining fungicides caused only 0-2% of reduction in the efficacy of B. bassiana. Both Captan and Thiram are broad spectrum fungicide acting through multi-site contact and differ from others, except for Microthiol Disperss (Mode of action group M2), in their modes of action. Time interval between B. bassiana and different fungicides did not seem to have any impact on the total mortality of mealworms. Although the total mortality caused by B. bassiana ranged from 30-57% in Captan and 33-77% in Thiram treatments at different time intervals, differences were not statistically significant (P > 0.05). Table 1. Total mortality caused by B. bassiana when fungicides were applied at different time intervals. *Means followed by the same letter within each column are not statistically significant (Tukey's HSD P > 0.05). There was no significant difference in values within each row i.e., no difference in time intervals between B. bassiana and any of the fungicides. This study shows that several of the fungicides commonly used in strawberries are compatible with B. bassiana. When B. bassiana is considered for pest management, Captan and Thiram should be avoided. Fungus-based microbial pesticides play an important role in conventional agriculture and understanding their interaction with fungicides helps with their effective use in pest management. Dara, S. 2013. Microbial control as an important component of strawberry IPM. February issue of CAPCA's Adviser magazine, pp 29-32. Dara, S. 2014. New strawberry IPM studies with chemical, botanical, and microbial solutions. February issue of CAPCA Adviser magazine, pp 34-37.